University of Maryland President Wallace Loh said Thursday that he told the school’s governing body that “all hell will break loose” if DJ Durkin was retained as head coach of its football team after a player’s death, a warning that went unheeded. Loh told a panel of state lawmakers that members of the University System of Maryland board of regents asked him on Oct. 26 if he would support Durkin’s reinstatement as coach. Loh said he explained why he couldn’t do that after the death of 19-year-old offensive lineman Jordan McNair, who collapsed from heatstroke on a practice field in May and died two weeks later. The board’s chairman announced on Oct. 30 that Durkin and athletic director Damon Evans would keep their jobs. But a backlash that reverberated far beyond the university’s campus led to Loh firing Durkin a day later. During the news conference where the board chair said Durkin would be reinstated, Loh made the surprise announcement that he would retire in June 2019. “I completely accept the fact that the board has authority to hire and fire presidents. It is also the case that, as president, I have the authority on personnel issues,” Loh told members of the House Appropriations Committee. James Brady resigned as board chair a day after Durkin’s firing. 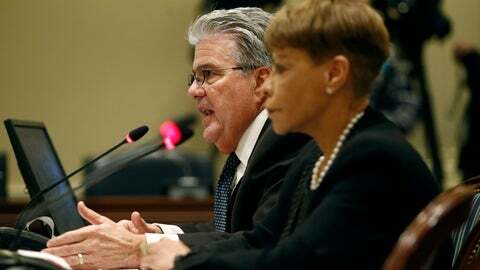 Linda Gooden, who replaced Brady, and System Chancellor Robert Caret also spoke at Thursday’s hearing in Annapolis. Del. Ben Barnes, a Democrat, asked Caret if the board pressured Loh to retire. “You’re not going to like this answer, but the board really does not feel that a personnel decision that is made in executive session should be discussed in open sessions,” Caret said, drawing an angry response from the lawmaker. “We’re here to have answers as to how you determined your decisions. If you’re not going to give us these answers, what are we all doing here today?” Barnes asked. Durkin’s firing came in the third season of a five-year, $12.5 million contract he signed in December 2015. He will be owed about $5.5 million, according to buyout terms of his contract. Gooden said some board members felt strongly that they should recommend firing Durkin, but they were outnumbered.